The Terraduro MTB Shoe is the new standard for all mountain riding. With most MTB shoes catering to XC style riding, Giro saw a need for a shoe that can handle everything the mountain has to offer, and with professional rider input developed the Terraduro. 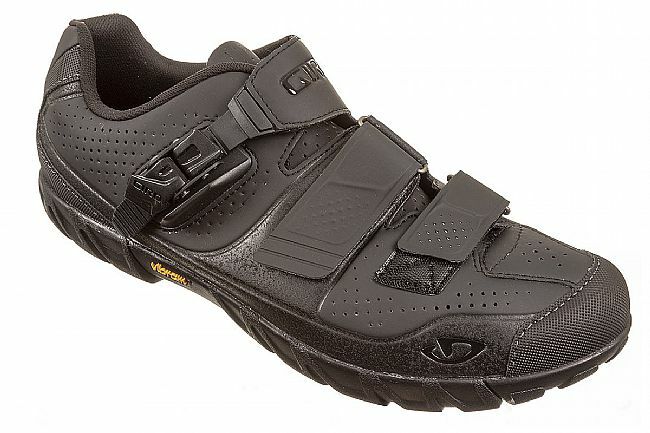 Like many MTB shoes, this one features a highly breathable microfiber upper, and great retention from a micro-adjust buckle (replaceable) and two velcro straps (offset for increased comfort and fit). Where this shoe really sets itself apart, however, is its beefed up sole. 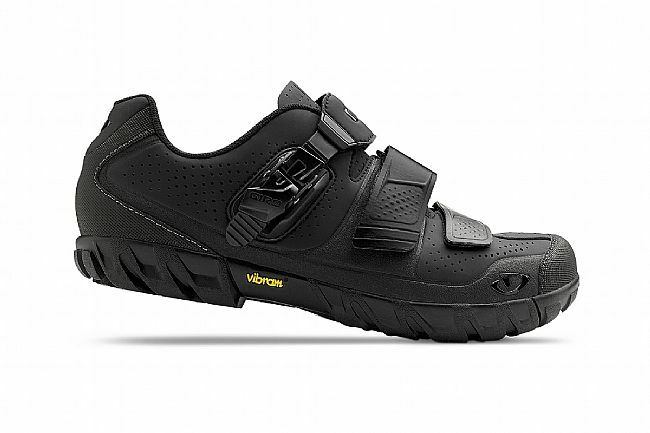 Produced by Vibram®, it provides excellent grip for walking over roots and rocks, because sometimes mountain biking requires being off the bike. The placement of the Terraduro's shank also allows for enough flex in the shoe for walking or running comfort, while maintaining stiffness where needed for race ready power transfer. Compatible with two-bolt mountain cleats. The Terraduro MTB Shoe is available in Black and Glowing Red/Black and a wide range of sizes. Very comfortable, easy to fasten, We'll see how they wear. I ride thru very rough terrain. I've been looking for this in a cycling shoe for years. I am a single speed mountain biker and getting off the bike to hike up happens. I have been using Sidi shoes for years and they are great if you do not have to walk/hike any where. They are kind of like ice skates. The Vibram soles on these are truly great. The trails I ride on are often rocky, slippery, muddy and filled with tree roots. These shoes are like a good pair of hiking shoes when on foot. I have high arches and had no trouble adjusting them to my foot. Very comfortable. I have had them for two muddy months and they have performed perfectly. Sizing is spot on. Great shoe if you have to do any walking. Decent for cycling too. I bought these shoes for a high speed lightweight tour I'm planning to do. I don't plan on carrying another pair of shoes so the shoe has to be walkable and it has to be a decent cycling shoes. This shoe meets that and exceeds that need. My regular MTB shoes are high end with carbon soles and do not. They are great for serious cycling but they won't meet the walkability need. I have a D width to D width foot. I wear a 44 or 44.5 in Sidi. I bought the 44.5 Terraduro in the HV model and they are a perfect fit with my toes just shy of touching the front. A 45 was too big and too high volume. To test them, I walked a mile straight in them with no problem. They meet the walkability spec. I also tested them with about 100 miles of hammering road biking where I was standing on the pedals, sprinting, climbing hills at high cadence, etc... all the things you'd want a good cycling shoe to do well. They did very well at that - not as well as my carbon fiber shoes, but well enough. They are significantly heavier and the strapping system is fairly old school but my foot was held securely and there was no significant flexing of the sole. I'm not a little guy so this is a pretty good test. So for my purposes this is the perfect shoe for the kind of touring I do and for those rides where you explore areas and get off the bike and walk around. I also think they are a perfect gravel ride shoe and they'd be pretty good for regular mtb usage where you are going to have to get off and hike-a-bike on occasion. Very happy with this purchase. Where they could improve this shoe is by changing the ratchet and first velcro strap to be a boa type system. I find that this fits feet better and holds them more securely with less pressure points. They could also work a little harder and get the weight down (at about 430g per shoe). They are a little on the chunky side for an mtb shoes but I suppose that is the price you pay for such a robust and walkable Vibram sole. Love these Terradura for the fit & stiffness. Had not had much trail use yet since it is still ski season & in the snow here. I am looking forward to when I can get on trail in the desert soon. I really like the platform and stability of these shoes on my SPDs and coming out of the pedal and planting on uneven terrain, much more than my Sidi Dominator 5s. They are not quite as stiff as the Dominator 5, but thats good if you have to exploit the Vibram sole hike a bit. But the fit, I wear an 11.5 US and bought the recommend 45.5, rode them a while, too small, eat that pair. Bought the 46 and the length is right, but these shoes have a lot of arch volume, normal toe box and good heal cup. I have a narrow foot and the Dominator 5 fits me like a glove, but these are not as well crafted in the arch area. Im going to continue to try and make them work, but Im afraid Im going to run out buckle or velcro in the arch area. 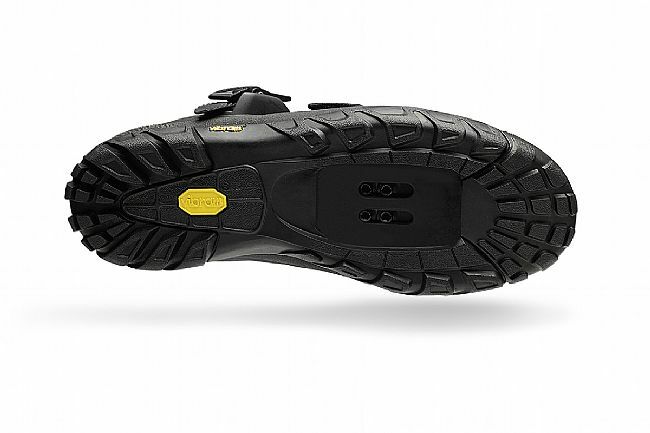 Its too bad Sidi doesnt make a Vibram sole shoe. I'm a long time Shimano user, but after my last pair (M-162's) developed a rip prematurely , I wanted to try something different. My first impression when trying them on at home was that they were a little on the tight side. I looked up some other sources that suggested wearing them around the house awhile to break them in first. I did this, and it seemed to help a little, but I was still was concerned. All my concerns disappeared in my first ride. They just felt like they were custom made for my feet to the point that I almost forgot that I had them on. They are so comfortable that I often put them on at the house and drive in them to the trail head! One added bonus that I noticed is how much stiffer they or over my previous shoes. Plus, they are a couple ounces lighter too. I can't imagine any kind of riding that these won't work for other then someone wanting a lighter shoe for XC racing. These are not the least expensive shoes you can buy, but in this case, you get what you pay for. customer care of both GIRO and Bike Tire Direct were both awesome about trying to help by returning them or offering different installation solutions. It fits a little small but pretty true to size. Nice and light yet they feel sturdy. When peddling, you don't notice any flex but as soon as you jump off, they feel almost like a regular hiking shoe. The bottoms are soft enough for gripping but not wimpy in the rocky stuff. So far I have only used the in dry to damp conditions and the we awesome. They felt so good, last week I almost jump back into the truck without changing back into my crocs. The true test will be in slippery wet and dicey. A great trail shoe, comfortable, light, plenty stiff, and great traction. 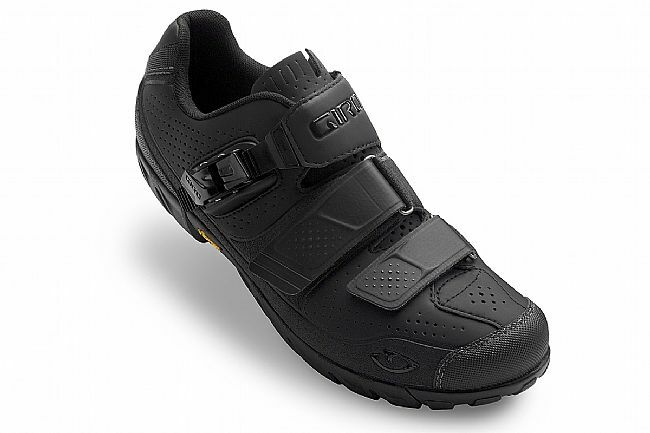 The Giro Terraduro is only 2 oz per shoe heavier than my 42cm Sidi Dominator 5, but is more comfortable, had great traction off the bike, and seems equally stiff. Unless you are toeing the line of a XC race, this Giro shoe reigns supreme. One big Terraduro bonus is that the traction and comfort for any slick off-bike section is excellent. With plenty of pedaling stiffness, reasonable weight, and great terrain traction, I'll probably never go back to a Sidi Dominator for a trail shoe. Awesome, great value MTB shoe for those of us who need to do a bunch of hiking while biking. Very comfortable and useful shoe. Good stable platform for technical MTB riding. This shoe cradles the foot well, has a nice stiff sole that transfers power well, and allows very comfortable hiking when necessary. I hope Giro still makes this shoe when I eventually wear out this pair! Good shoes, though a little heavy - latch has already failed on one shoe after a dozen uses. Pretty mud proof, but not waterproof. Latch on one shoe has already failed and I think the design is not rigorous like my Sidi shoes. I'm really happy with these shoes and wear them instead of my XC raced style shoes for all bug the fastest rides. They are stiff when pounding the pedals and have a nice amount of toe flex plus excellent traction when off the bike. I bought the glowing red version and will likely buy the black version to have another pair for lower key looks. Highly recommended! excellent fit - conforms to foot after a few rides. Great fit. Hopefully will hold up over the long term.